There was a common factor that glued together the friendly ties between President Mahinda Rajapaksa and his Ugandan counterpart Yoveri Museveni. Both countries maintain close ties with China. Days ahead of President Rajapaksa’s visit to that country, China built and handed over a twin-block 11 storied building complex for use as the President’s office. Those days also saw President Museveni at the centre of a controversy after he handed over a sack containing US$100,000 to a supporter for distribution at a political rally. The Kampala media accused him of paying money to win support. The donation (which also included a truck and 15 motorbikes for good measure) was broadcast on national television and soon went viral on You Tube and Twitter, where Museveni quickly became a target of scorn from those who questioned the money’s origin and how it would be spent. However, those controversies did not mar the Sri Lankan President’s visit. The Uganda leader hosted President Rajapaksa at his official residence. Some Sri Lankan dishes were also included using fish from Lake Victoria. An Indian meal came for Rajapaksa when he visited Uganda’s largest sugar factory. The Indian family that owns it hosted him to a luncheon. It may be recalled that when he visited Sri Lanka last year, President Museveni not only brought along his chef in the official entourage, but also crates of mineral water for his use. If he was taken into custody by the Terrorism Investigation Division of the Police as a lesser known politician, Azath Salley emerged a political hero. This was when he was released within a week though there was an order to detain him for month. The sudden release came on an overriding order by President Mahinda Rajapaksa. “Question: There is a Muslim leader in Sri Lanka, Azath Salley, who, he’s recently been arrested under anti-terrorism charges. He may be released having issued some kind of confession, but the news there is that he says that he wrote recently to… to Ban Ki-moon asking him and the UN system to look into the crackdown on Muslim community by Government-allied Buddhist extremists and… and… and was the letter received, is there any response or comment? Opposition UNP leader Ranil Wickremesinghe was among several leaders who visited Sally in hospital. He said Sally should be grateful to President Mahinda Rajapaksa because he has made him popular both in Sri Lanka and abroad. An e-mail message, which was in circulation last week about Alexander the Great of a bygone era had a mischievous Sri Lankan twist to it. As urban legend has it, the Macedonian King had three last wishes on his death bed. First, he wanted the best doctors to carry his coffin demonstrating that in the face of death, even the best of doctors could not cure him. 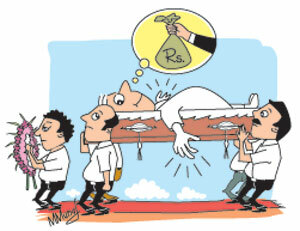 A smart ‘Alex’, however, added a punch line to the Alexander the Great’s final wish: If a Sri Lankan politician wishes his hands be left hanging outside the coffin, it only means he wants to collect his last bribe on the way to Kanatte. Some Bodu Bala Sena (BBS) members have a habit of saying things publicly and then backtracking. The latest such incident was this week when a BBS member said at a news conference that the groups would send its members equipped with canes to punish those who were engaged in activities that brought disrepute to Buddhism. The next day the BBS backtracked and said the statement was meant only to create awareness among people about their wrong conduct. “We made the statement because this way people will start talking and the message will be passed from person to person giving the message that people shouldn’t act in an inappropriate manner during the Vesak season,” said BBS secretary Ven. Galabodaaththe Gnanasara Thero. Former UNP Deputy Leader Sajith Premadasa attended last week’s UNP working committee meeting at ‘Sirikotha’, the party headquarters. He raised issue over the importance of the party having a cordial relationship with the media. He mentioned the name of a private TV channel and its owner and asked why the party leader who was once friendly with him did not patch up differences. The comment came in the backdrop of a total blackout of the party and its activities by the station over some dispute. Young Premadasa who was getting wide coverage by the station is also now being blacked out. When the matter was raised, party leader Wickremesinghe said, “that’s funny; only a little while ago Ravi Karunanayake (MP from the Colombo district) came and made the same request”. Karunanayake is also a victim of the blackout. But it’s a public secret in the party that Premadasa and Karunanayake do not hit it out at each other though not on speaking terms. So, Wickremesinghe asked both Premadasa and Karunanayake to speak to each other and work out a solution so it can be taken up with the party leader. In the same spirit, he said, it was important for Premadasa to maintain cordial relations with his arch-rival Ravi Karunanayake. Thailand’s Prime Minister Yingluck Shinwatra who arrives on an official visit to Sri Lanka on May 31 will create history. Within hours of her arrival, she will address Parliament. She will follow her brother Thaksin Shinwatra who as Prime Minister was also extended this honour in August 2003. The one-time Prime Minister, who is hugely popular, now lives in exile. This is the first time a brother and sister as prime ministers of their country would be sharing this honour. Ahead of Premier Yingluck’s visit, President Mahinda Rajapaksa, according to sources at the Presidential Secretariat, will pay a visit to China. He will, however, be on hand to receive the Thai Premier, these sources said. During Wednesday’s joint Opposition protest campaign in Colombo over the increase in electricity tariffs, there were some scary movements. 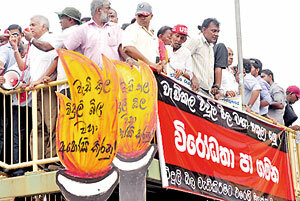 Opposition Leader Ranil Wickremesinghe was looking for a suitable location to address the large gathering after protestors had gathered outside the Colombo Fort Railway Station. He decided to move on to the overhead bridge on the opposite side. That not only gave him a vantage point but also enabled most protestors to see him. But an enthusiastic crowd of some thousands had already perched themselves on the bridge. On top of that, people also used the bridge to get to the railway station. The overloaded bridge began vibrating. Fears that it would collapse worried Wickremesinghe’s security detail. One of the Ministerial Security Division (MSD) officers took up position near the stairway and immediately blocked more people from climbing the bridge. Mr. Wickremesinghe was advised of the danger posed. He quickly finished his speech and withdrew. So did former Army Commander Sarath Fonseka.